how do you repack it back? isn't posting extracted files sort of illegal? wouldn't it be better to post the decompression tool instead? 0002.p holds the character data. sprites, programming, etc. 0004.p has some misc things like the font and character select screen file. justinefremlouw wrote: how do you repack it back? you don't have to repack things as long as you extract all the files, and keep the correct folder/file structure while removing the corresponding .p file to see the changes. Last edited by Ciel on January 30th, 2012, 2:27 pm, edited 1 time in total. can you tell me the tool you used to extract the p files? Or if it's allowed, the folder of the entire 0007.p? probably both. everything for 0007.p should be in a "story" folder in their own subfolders. first "battle" subfolder. all txt files are there. 268 files, 666 kb. then "st_name". all of the character name pictures are there. 42 files, 661 kb. i think uploading the file's contents would count as warez. then it is incomplete...can you tell me the tool u used to extract the p files? first try to do something with the translating stuff. you'll also need to remove 0004.p and replace it with the contents of the first file to get the halfwidth font from mirrormoon's mbac working. 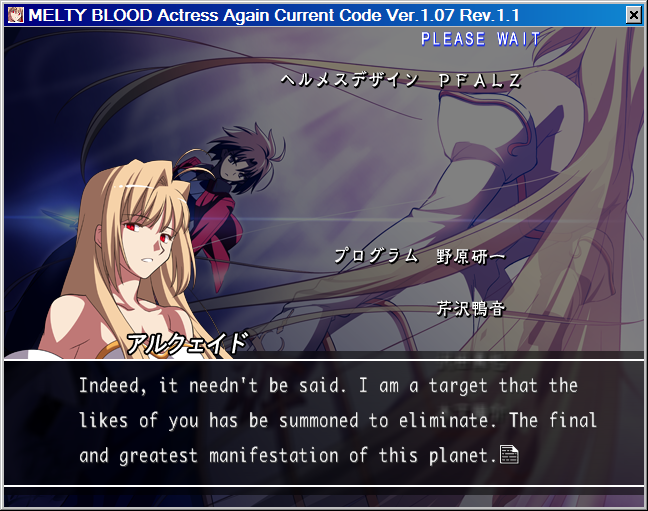 which replace 0007.p and it should translate ryogi's arcade mode. used the translation by some guy called curbeh.